Many thanks to all of our 2018 Vendors and Commercial Exhibitors! Your participation and interest in the Howard County Fair is most appreciated! We’re looking forward to your return in 2019! Vendor space is offered to the previous year's vendors first and from there a wait list is created for all new inquiries. Contracts for vendor space at the 2019 Howard County Fair will be mailed out in February 2019. To request a vendor application, please send your business name, point of contact phone number, email, mailing address and website to the appropriate contact listed to the right. For more information on Main Exhibition Hall & Non-Food Vendors, please contact: Vaughn Turner - info@howardcountyfairmd.com | 410.442.1022. For more information on Food Vendors, please contact: Dale Hough - whough@umd.edu | 410.795.5596. All vendors are required to be at the fair all eight (8) days of the fair, from August 3rd - 10th, 2019. Set-Up: Thursday (8/1), Friday (8/2) from 9AM-5PM, and Saturday (8/3) from 8AM-10AM. All booths must be set up by 10AM on Saturday (8/3). Packet & Passes Pick-Up: Your packet & passes will be available for pick-up at the Main Exhibition Hall upon check-in, during set-up. Four (4) season passes and one (1) vehicle pass will be provided to each exhibitor. Break-Down: Saturday (8/10) after 10pm and Sunday (8/11) from 10AM-2PM. 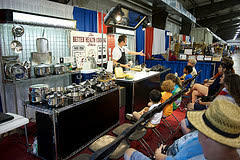 During fair week, the Main Exhibition Hall will be open to vendors at 9:45AM and will open to the public at 10AM. The hall closes to the public at 10PM each day. All exhibitors must leave the hall by 10:30PM when the hall will be locked. All vendors must park outside the fenced in area. Shuttle transportation to your location can be requested to the gate attendant. * The layout of all Main Exhibition Hall vendors will be available in Mid-July 2019. Assignments are subject to change. * The map of all outside vendors will be available in Mid-July 2019. Assignments are subject to change. Main Exhibition Hall (MEX) Commercial Exhibitors’ booth assignments are identified with the letter A, B, C, or D followed by a number. 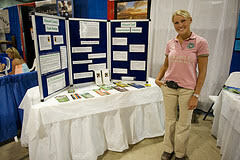 Outdoor Commercial Exhibitors are identified by location on the fairgrounds. 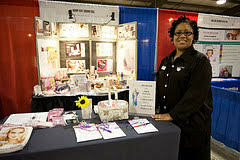 The information included in the List of Commercial Exhibitors is subject to change. A complete list of our 2019 Commercial Exhibitors will be available to download in Mid-July 2019.